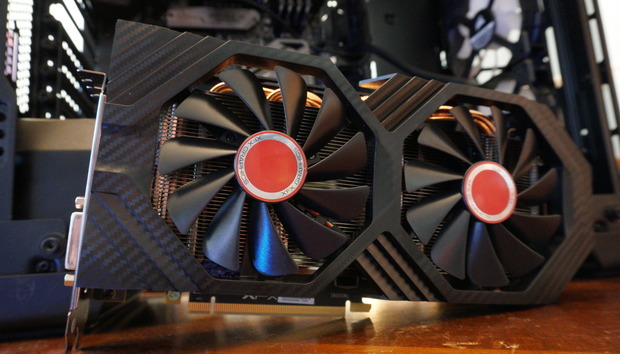 How can improvements to the GPU manufacturing process make graphics cards better? There’s no one solution, and today’s launch of the $280 Radeon RX 590 shows that Nvidia and AMD took two wildly divergent paths in the shift to the 12nm process. Nvidia’s used the extra space and process improvements to cram its GeForce RTX 20-series graphics cards with radical, futuristic hardware devoted to driving adoption of real-time ray tracing and machine learning in games. The downside? The cheapest RTX option, the RTX 2070, starts at $500. AMD took a different tack: The Radeon RX 590 is essentially identical to the $240 8GB Radeon RX 580 under the hood, but shifting from 14nm to 12nm let AMD eke out much higher clock speeds than before—and prep a new graphics card that challenges the massive price gap between the $250 GTX 1060 and $370 GTX 1070. Well, new-ish. 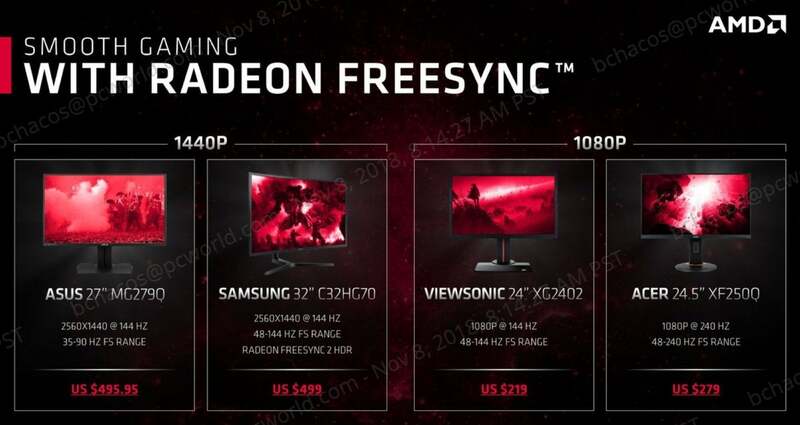 AMD’s (rightfully) touting the price advantages of the Radeon/FreeSync ecosystem alongside the Radeon RX 590’s release, bolstered by an aggressive bundle of three hotly anticipated upcoming games, but how much more can the company squeeze out of the Polaris GPU architecture? The Radeon RX 580 was already a slightly faster version of the Radeon RX 480, after all. Let’s find out what happens when you dedicate GPU process improvements to cranking clock speeds to 11. The faster reference clock speed doesn’t tell the whole story. AMD isn’t shipping a reference version of the Radeon RX 590, instead relying on its board partners to distribute custom-cooled models. Some, like the XFX Radeon RX 590 Fatboy that we’re testing today, ship factory-overclocked—to 1,580MHz out of the box, in the Fatboy’s case. 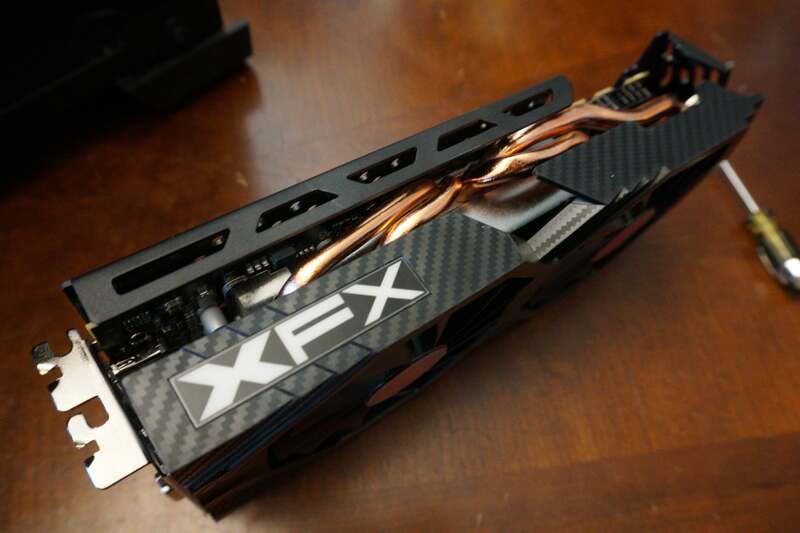 XFX says the card will overclock to 1,600MHz no problem, if you feel like tinkering, as that’s the frequency setting the company’s labs use during testing and qualification as part of XFX’s OC+ program. A card in the box explains how to use AMD’s Radeon Wattman tool to activate the higher clocks. 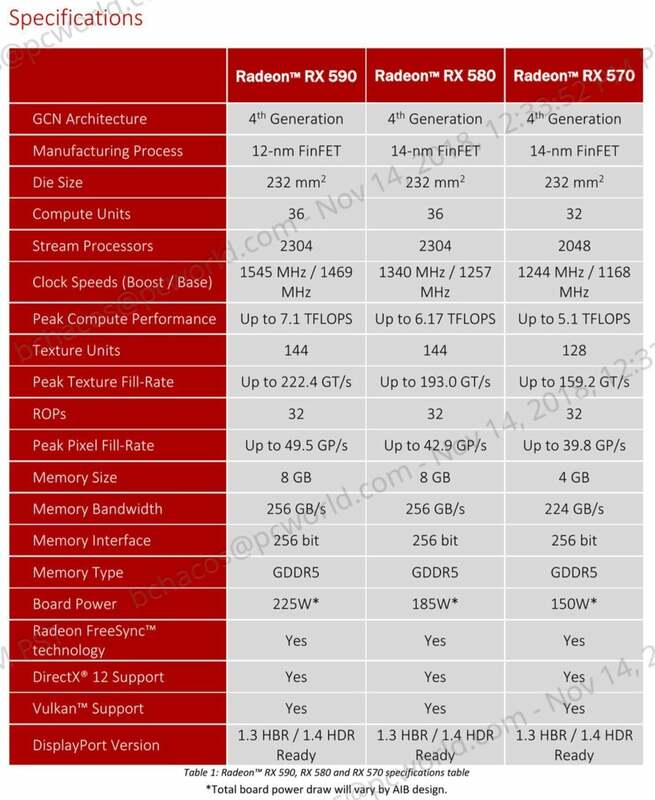 Pushing AMD’s Polaris GPU architecture this hard doesn’t come easy, it seems. Upgrading the Radeon RX 480 to the RX 580 made an already power-hungry GPU even more so, and turning the Radeon RX 580 into the RX 590 seemingly demands even more energy despite the shrink to 12nm. 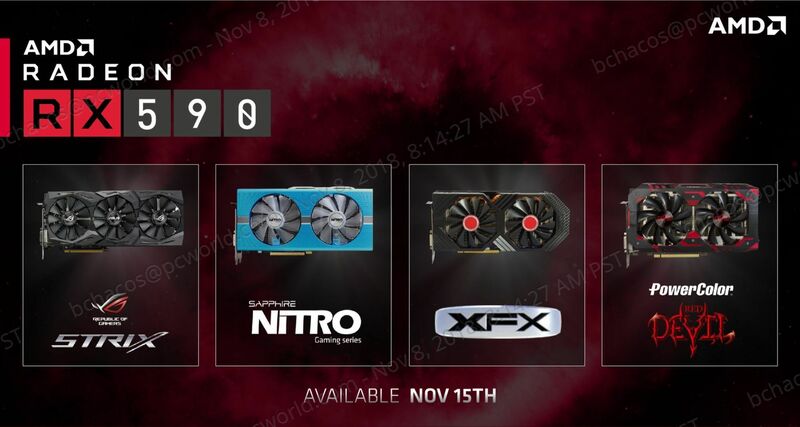 All four of the custom cards confirmed for the Radeon RX 590’s launch—the XFX Fatboy, Asus ROG Strix, Sapphire Nitro, and PowerColor Red Devil—feature ferocious, high-end cooling solutions bristling with fans and heavy metal to tame this GPU’s higher power draw (which we’ll detail later in the benchmarks section). The XFX Radeon RX 590’s “Fatboy” cooler is basically the XFX RX 580’s GTS cooler on steroids—hence the name. The dual large fans on the sculpted shroud still make the card look kind of like a surprised owl. But the primary heatsink is much, much thicker: 25.96mm on the Fatboy, compared to 16.96mm on the RX 580 GTS models. That gives the heatsink a total surface area of 368,866mm2, or nearly 125,000mm2 more than the RX 580 GTS. Thick composite copper pipes snake throughout the thick heatsink, which sits atop a unibody VRM heatsink that facilitates better heat transfer to the main cooling apparatus. This is a serious cooler—and, no surprise, a triple-slot graphics card. XFX equipped the Radeon RX 590 Fatboy with a branded backplate to keep all that heavy metal from sagging and help dissipate heat. An always-welcome dual-BIOS switch lets you choose between maximum performance or quieter noise levels. Our testing was done using the default Performance BIOS, though the Quiet BIOS hushed the Fatboy much more effectively. 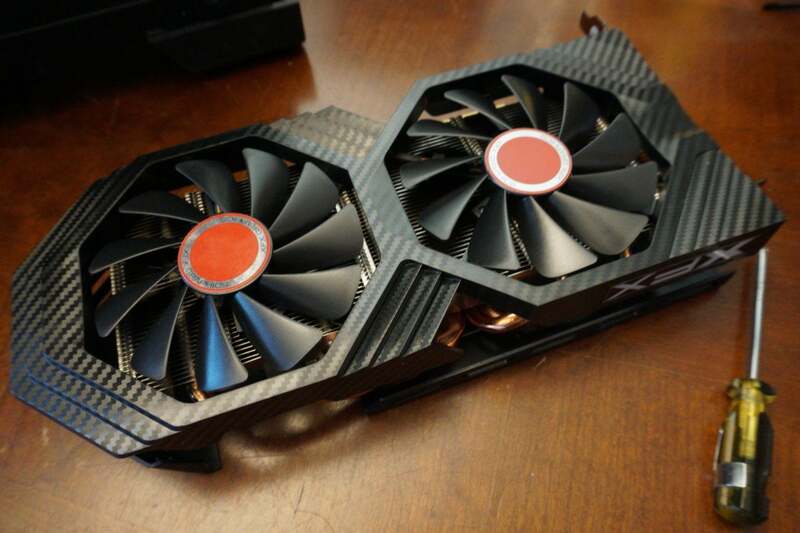 XFX loaded the Radeon RX 590 Fatboy with a trio of DisplayPorts, an HDMI port, and DVI-D. You’ll need an 8-pin and a 6-pin power connector to run the graphics card, and XFX recommends a 600-watt power supply, up from the 550W recommended for XFX’s GTS RX 580 GPUs. The XFX Radeon RX 590 Fatboy will launch at $280 Thursday at Amazon, Newegg, Best Buy, Walmart, Fry’s, Microcenter, and Memory Express. But the graphics card isn’t all you’ll get for your money: AMD’s including “the Blockbuster Game Bundle” with all Radeon RX 590s sold at participating retailers. The bundle gives you free codes for The Division 2, Devil May Cry 5, and Resident Evil 2. You won’t be able to play them right away, though, since all three of these hot triple-A games are scheduled to launch early in 2019. With that, you know everything you need to know about the XFX Radeon RX 590 Fatboy. Now let’s see how it handles. Our dedicated graphics card test system is packed with some of the fastest complementary components available to put any potential performance bottlenecks squarely on the GPU. Most of the hardware was provided by the manufacturers, but we purchased the cooler and storage ourselves. We’re comparing the $280 XFX Radeon RX 590 Fatboy against the Asus ROG Strix RX 580 Gaming Top OC, which cost $300 when it launched, as well as EVGA’s 6GB GeForce GTX 1060 SSC ($310 on Newegg). We typically like to test the first example of a new GPU using stock configurations, but because the Radeon RX 590 is only shipping in custom, overclocked versions, we’re comparing the Fatboy to custom, overclocked rivals. To show how these $200 to $300 cards compare against step-up options, we also tested the $400 reference Radeon RX Vega 56 and $380 GeForce GTX 1070 Founders Edition. Each game is tested using its in-game benchmark at the highest possible graphics presets, with VSync, frame rate caps, and all GPU vendor-specific technologies—like AMD TressFX, Nvidia GameWorks options, and FreeSync/G-Sync—disabled, and temporal anti-aliasing (TAA) enabled to push these high-end cards to their limits. If anything differs from that, we’ll mention it. We focused our testing on 1440p and 1080p, as those are the natural resolutions for these graphics cards. Let’s kick things off with Strange Brigade ($50 on Humble), a cooperative third-person shooter where a team of adventurers blast through hordes of mythological enemies. It’s a technological showcase, built around the next-gen Vulkan and DirectX 12 technologies and infused with features like HDR support and the ability to toggle asynchronous compute on and off. It uses Rebellion’s custom Azure engine. We test with async compute off. Both the Radeon RX 580 and Radeon RX 590 are significantly ahead of the 6GB GTX 1060. The Radeon RX 590 is about 8.5 percent faster than the Radeon RX 580 at 1080p resolution, and 6.66 percent faster at 1440p. As expected, the Vega 56 and GTX 1070 are much faster. Shadow of the Tomb Raider ($60 on Humble) concludes the reboot trilogy, and it’s utterly gorgeous—even the state-of-the-art GeForce RTX 2080 Ti barely manages to average 60 fps with all the bells and whistles turned on at 4K resolution. Square Enix optimized this game for DX12, and recommends DX11 only if you’re using older hardware or Windows 7, so we test with DX12. Shadow of the Tomb Raider uses an enhanced version of the Foundation engine that also powered Rise of the Tomb Raider. 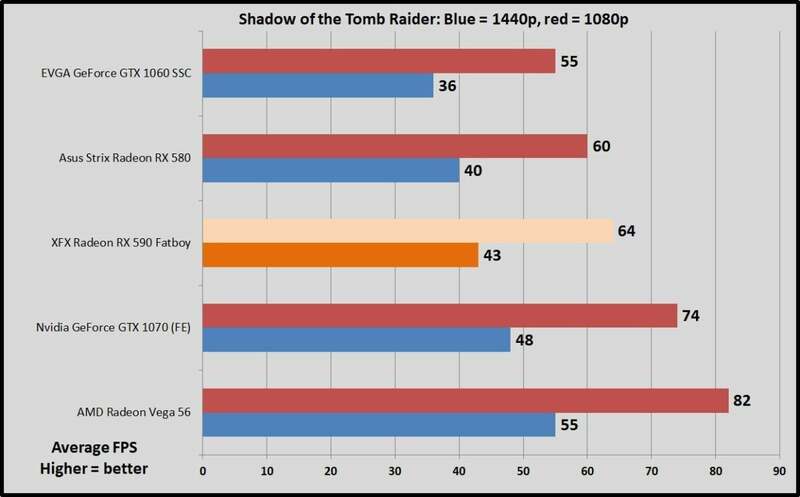 Even though Tomb Raider is ostensibly an Nvidia-backed game, the XFX Radeon RX 590 Fatboy outpaces the similarly-ish priced EVGA 6GB GTX 1060 SSC by 16.36 percent at 1080p resolution and 19.44 percent at 1440p resolution. The Radeon RX 580 sticks to within 7 percent of the performance of its newer, faster cousin. Finally, a DirectX 11 game! Far Cry 5 ($60 on Humble) is powered by Ubisoft’s long-established Dunia engine. It’s just as gorgeous as its predecessors, and even more fun. The GTX 1060 closes the performance gap in Far Cry, pulling within roughly 7 percent of the XFX Radeon RX 590 Fatboy at 1080p, and 12 percent at 1440p resolution. The Radeon RX 580 matches the GTX 1060’s performance at 1080p and beats it slightly at 1440p. The Radeon RX 590 beats all comers, though. Move over, Crysis. If you crank all the graphics options up to 11, like we do for these tests, Ghost Recon Wildlands ($50 on Humble) and its AnvilNext 2.0 engine absolutely melt GPUs. 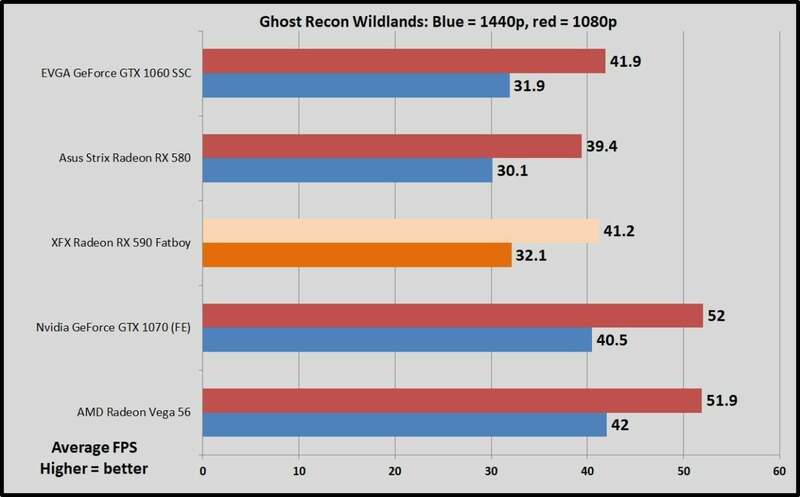 Ghost Recon Wildlands also prefers Nvidia’s GPU architecture, and the overclocked GTX 1060 draws even with the XFX Radeon RX 590 Fatboy here. All three mainstream GPUs deliver similar results at the demanding Ultra graphics settings, and even the pricier $400 graphics cards can’t surpass the hallowed 60-fps barrier. Dropping the options down to High greatly increases performance. Middle-earth: Shadow of War ($50 on Humble) adds a strategic layer to the series’ sublime core gameplay loop, adapting the Nemesis system to let you create an army of personalized Orc commanders. It plays like a champ on PC, too, thanks to Monolith’s custom LithTech Firebird engine. We use the Ultra graphics preset but drop the Shadow and Texture Quality settings to High to avoid exceeding 8GB of VRAM usage. The Fatboy keeps its lead, triumphing over the EVGA GTX 1060 SSC by 9.5 percent at 1080p resolution. 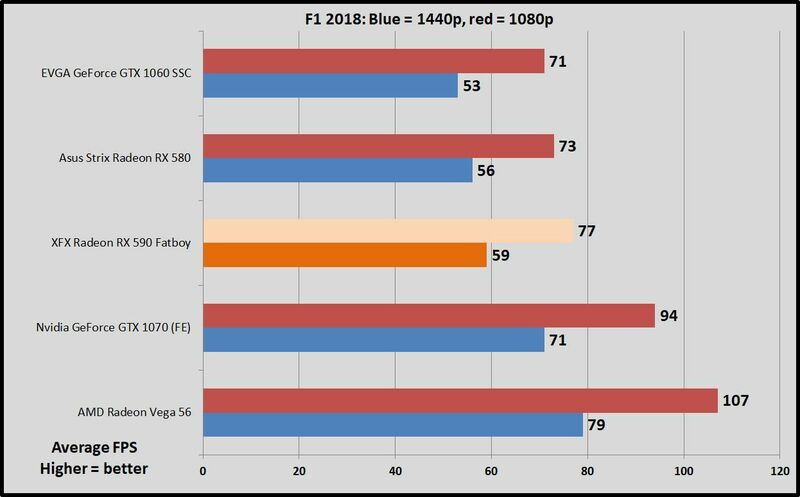 It continues to outpace the RX 580 by about 8 percent at 1080p, though the performance gaps effectively close at 1440p. The trends we’ve been seeing continue here. 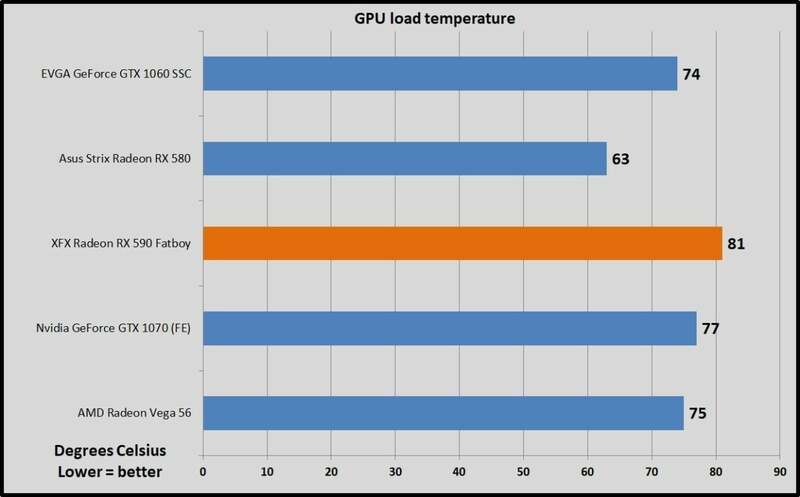 The XFX Fatboy is noticeably faster than the overclocked EVGA GTX 1060 SSC, slightly faster than the Asus Strix RX 580, and much slower than the much more expensive Vega 56 and GTX 1070. Ashes of the Singularity ($40 on Humble) was one of the very first DX12 games, and it remains a flagbearer for the technology to this day thanks to the extreme scalability of Oxide Games’ next-gen Nitrous engine. With hundreds of units onscreen simultaneously and some serious graphics effects in play, the Crazy preset can make graphics cards sweat. Ashes runs in both DX11 and DX12, but we only test in DX12, as it delivers the best results for both Nvidia and AMD GPUs. Nvidia’s put a lot of work into optimizing for Ashes, and it shows. We’re going to wrap things up with a couple of older games that aren’t really visual barnburners, but still top the Steam charts day-in and day-out. These are games that a lot of people play. First up: Grand Theft Auto V ($30 on Humble) with all options turned to Very High, all Advanced Graphics options except extended shadows enabled, and FXAA. GTA V runs on the RAGE engine and has received substantial updates since its initial launch. 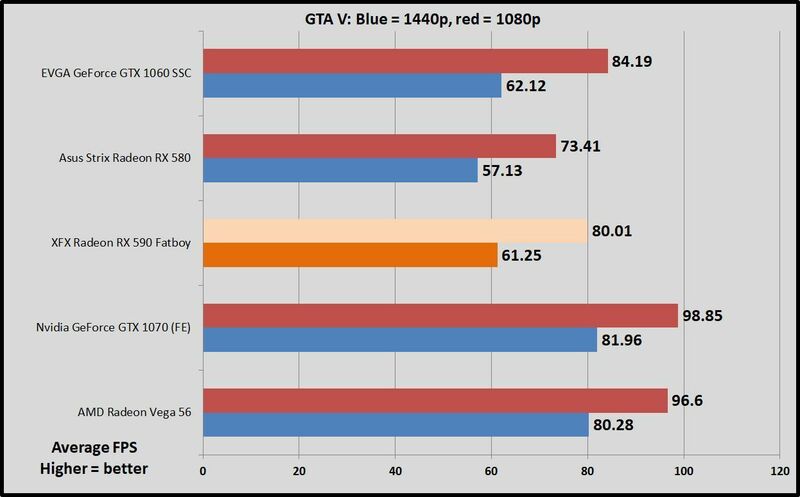 GTA heavily favors Nvidia GPUs (and GTX more than RTX). This is the only definitive victory for the EVGA GTX 1060 SSC. The Radeon options nevertheless deliver very playable frame rates at both resolutions. Finally, let’s take a peek at Rainbow Six Siege ($40 on Humble), a game whose audience just keeps on growing, and one that still feels like the only truly next-gen shooter after all these years. Like Ghost Recon Wildlands, this game runs on Ubisoft’s AnvilNext 2.0 engine, but Rainbow Six Siege responds especially well to games that lean on async compute features. As a counterpoint to GTA’s Nvidia favoritism, Rainbow Six Siege adores the asynchronous compute capabilities found in Radeon graphics cards, and the AMD duo mops the floor with the GTX 1060. The XFX Radeon RX 590 is a stunning 30 percent faster than the GTX 1060. Heck, it’s even faster than the $380 GTX 1070 here. 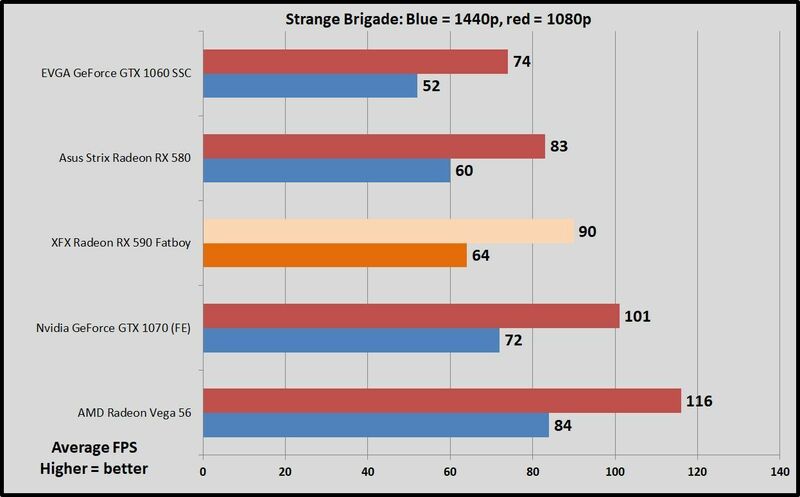 It’s only about 10 percent faster than the Strix RX 580 at 1080p, though. We also tested the GeForce RTX 2070 Founders Edition using 3DMark’s highly respected Fire Strike synthetic benchmark. 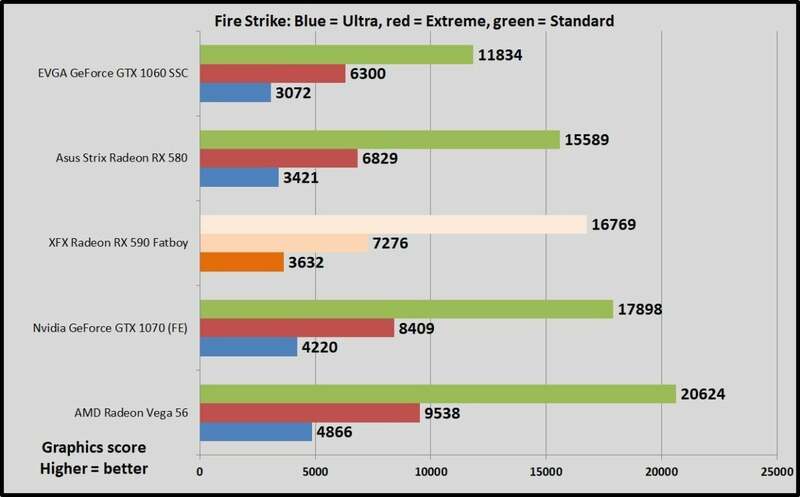 Fire Strike runs at 1080p (green bar), Fire Strike Extreme runs at 1440p (red bar), and Fire Strike Ultra runs at 4K resolution (blue bar). All render the same scene, but with more intense graphical effects as you move up the scale, so that Extreme and Ultra flavors stress GPUs even more. We record the graphics score to eliminate variance from the CPU. Yep, everything falls about where you’d expect after observing the gaming benchmarks, which is always the case with Fire Strike. We test power draw by looping the F1 2018 benchmark after we’ve benchmarked everything else with a card, and noting the highest reading on our Watts Up Pro meter. The initial part of the race, where all competing cars are onscreen simultaneously, tends to be the most demanding portion. Here’s where pushing AMD’s Polaris GPU to its ragged edge starts to show more drawbacks. 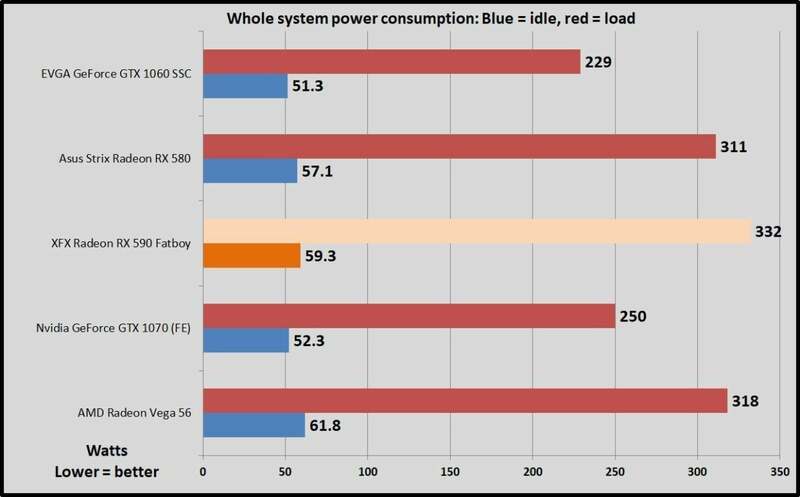 In order to crank the clock speeds so high and beat the GTX 1060 so consistently, AMD cranked the Radeon RX 590’s power consumption to 11, too—move-to-12nm-architecture be damned. The XFX Fatboy draws over 100W more than the overclocked EVGA GTX 1060 SSC, and it requires even more energy than the much more powerful Radeon RX Vega 56. We test thermals by leaving HWInfo’s sensor monitoring tool open during the F1 2018 5-lap power draw test, noting the highest maximum temperature at the end. AMD is clearly putting the pedal to the metal with the Radeon RX 590. Next page: Should you buy the AMD Radeon RX 590? Should you buy the XFX Radeon RX 590 Fatboy? Maybe, but it depends on a couple of factors. The $280 Radeon RX 590 is a killer option for no-compromises 1080p gaming, especially if you have a monitor faster than 60Hz. It’s also a very viable 1440p gaming option, especially if you don’t mind dropping graphics settings down from Ultra to High, or have a FreeSync-compatible monitor to help smooth out your gameplay. Comparable G-Sync monitors cost much more than this. In fact, as part of the Radeon RX 590 press blitz, AMD drove home how much more affordable the FreeSync ecosystem is compared to Nvidia’s pricey G-Sync options—and it’s right. The wide array of monitors you can buy without selling your firstborn is a feather in AMD’s cap, and the Radeon RX 590 would be a fine fit with a reasonably priced FreeSync panel. When it comes to sheer performance, the XFX Radeon RX 590 beats the overclocked EVGA GTX 1060 SSC in pretty much every game other than GTA V, and by a noticeable amount. In some games, like Shadow of the Tomb Raider and Rainbow Six Siege, the Radeon RX 590 utterly womps the GTX 1060’s frame rates—though Nvidia’s GPU maintains a significant edge in power consumption and heat levels. With comparable dual-fan 6GB GTX 1060s still usually selling for $270 and above, opting for the Radeon RX 590 feels like a no-brainer, especially with the three free games AMD’s throwing in. The RX 590’s bigger-boned predecessor is the potential spoiler here, though. At 1,580MHz, the XFX Radeon RX 590 Fatboy’s clock speeds measure in about 12 percent faster than the 1,411MHz we saw in custom options available at the RX 580’s launch, like the Sapphire Radeon RX 580 Nitro+ and the Asus ROG Strix we retested today. Despite that, this custom Radeon RX 590 is only 7 or 8 percent faster than the custom RX 580 in most of the games we tested. In some scenarios it was even less. Consider spending the extra cash on the Radeon RX 590 if you’re gaming at 1440p, though, as the boost can help it hit 60 fps in situations where the RX 580 falls just short. It’s a great option if you want to upgrade to a more pixel-packed monitor but shudder at the idea of spending $350 or more for a GTX 1070 or Vega 56. At the end of the day, the Radeon RX 590 shows the limits of what a simple process shrink can achieve with no corresponding architectural changes. It’s faster than the Radeon RX 580, but mildly so. It also needs a lot more juice and throws off a lot more heat to achieve those gains, even when paired with a thick, potent cooler like the XFX Fatboy’s. If you decide to go for an RX 590, we recommend sticking with a high-end custom variant like the Fatboy. Pushing Polaris this far clearly needs all the metal you can throw at it. 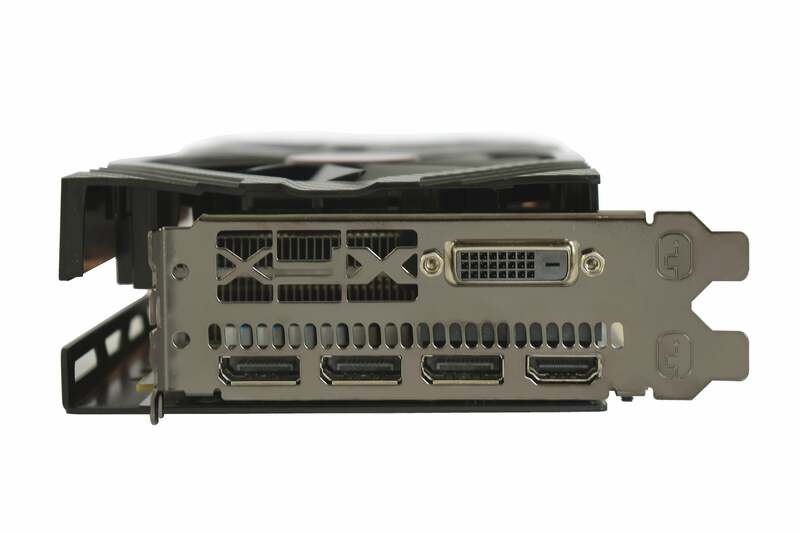 XFX also loaded this card up with ports galore and a much-appreciated dual-BIOS. But make sure it fits in your case before you buy! No matter whether you decide on a Radeon RX 570, 580, or 590, one thing’s certain—AMD has a stranglehold on the best mainstream graphics cards around.